The results of a very profitable photo safari of Western Transdanubia in the NW corner of Hungary. Hungary has been somewhere I've been meaning to go since at least the first series of Great Railway Journeys of the World back in 1980, when broadcaster Eric Robson set out from London and ended in Budapest. In the mid 1980s I even went as far as contacting the Hungarian National Tourist Office, getting details of hotels in Budapest and other cities and putting together an itinerary (by train of course, as this was pre 1989 before I learnt to drive). But for whatever reason nothing came of it, that is until now. 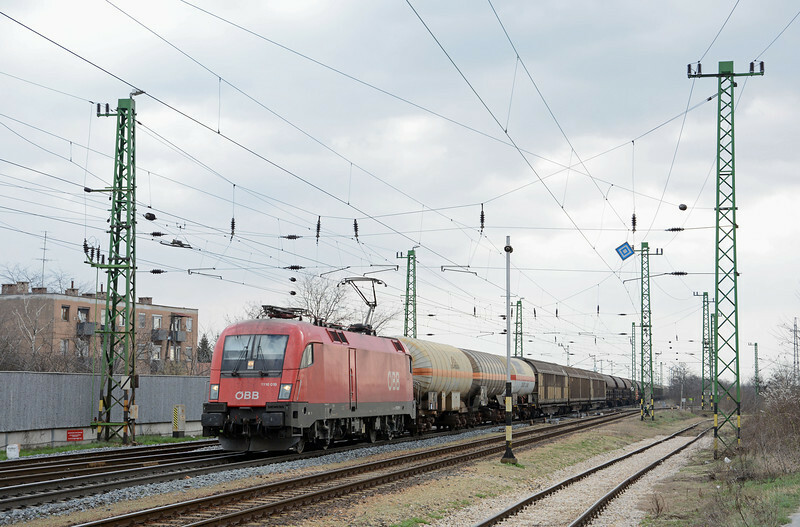 The Budapest to Vienna mainline is extremely busy with freight and passenger traffic, Rail Cargo Austria dominates but there are plenty of other freight operators to be seen. At times freight trains operate in flights, one following the other. And by European standards they are quite heavy. I've included the picture's locations as per Google maps. Hopefully someone will find them useful. From Bratislava in Slovakia I drove the 40 kms to Hegyeshalom, the border station on the Vienna to Budapest mainline where the Austrian OBB meets Hungary's MAV (Magyar Államvasutak). Hungary electrified at 25kV 50Hz, Austria at 15kV 16.7Hz. Consequently whilst some modern locomotives, like this OBB Siemens Taurus 1116, are dual voltage and are compatiable with the two countries different signalling and train control systems, others still have to change locomotives at the border. This rather wonderful (and long) mixed freight appeared not long after I arrived.